The Z-Bolt® BTG-2S-PB-XT is a special 515nm astronomy green laser pointer - scope mountable, use hands free. Low temp operation at 14°; constant-on switch; 2 pcs AAA batts; 5 mile range at night. 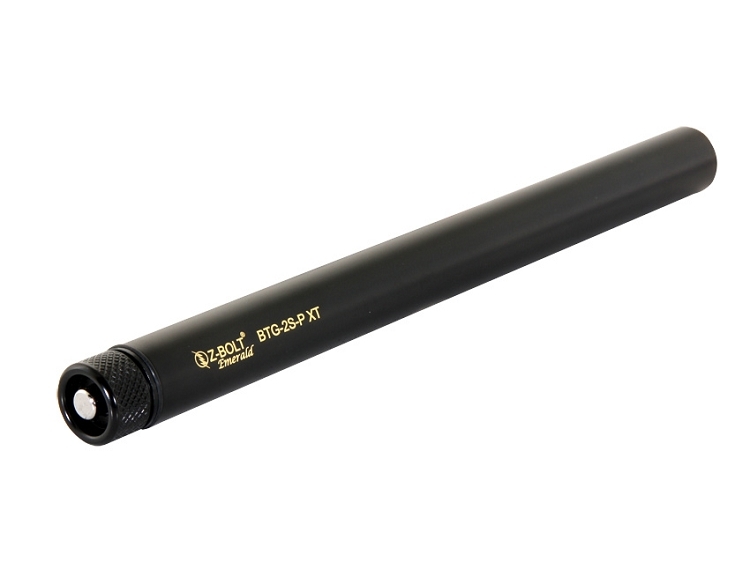 The Z-Bolt® BTG-2S-PB XT is constructed of high quality steel & brass components and includes an IR filter and glass lens for superior laser performance. Satin lined carry & gift case. Extreme Temp Operation 14° ~ 122°F - includes new 515nm semiconductor laser technology. Constant on/off click switch; telescope mountable; visible beam & five (5) mile range (at night). Add a Z-Bolt® cable switch for remote activation. The BTG-2S-PB XT features guaranteed Z-Bolt® Certified Power for the brightest possible daylight dot; most visible nighttime beam. 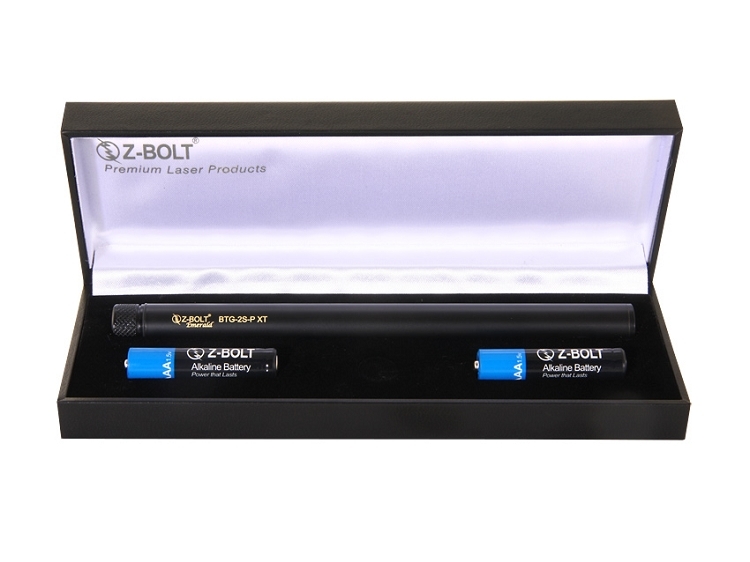 Each Z-Bolt® Certified Power green laser pointer is factory tuned & calibrated, then tested & certified on a laser power meter. These Certified Power units are rated at 4.0 to 5.0 mW power output and are 2 to 3 times brighter than standard Class IIIa units - all ship with our exclusive Laser Power Output Certificates. Wide 2.35" Base. With a radius-cut of 9.25", the base mounts snugly to virtually any reflector. Pre-existing holes with center-to-center spacing of 1.0" to 2.1" may be used to mount the base using two (2) screws; or four (4) screws with 1.75" center-to-center spacing may be used. Mounting hardware (8-32 screws/nuts) included. Features a smaller base to take up less space on your refractor. With a radius-cut of 1.75", the base fits snugly on most refractors, and is mounted with industrial-strength double-sided tape, included. Base is 1.12" wide at the bottom; 0.88" wide at top and 1.5" long. Height to ring-top is 2.6". 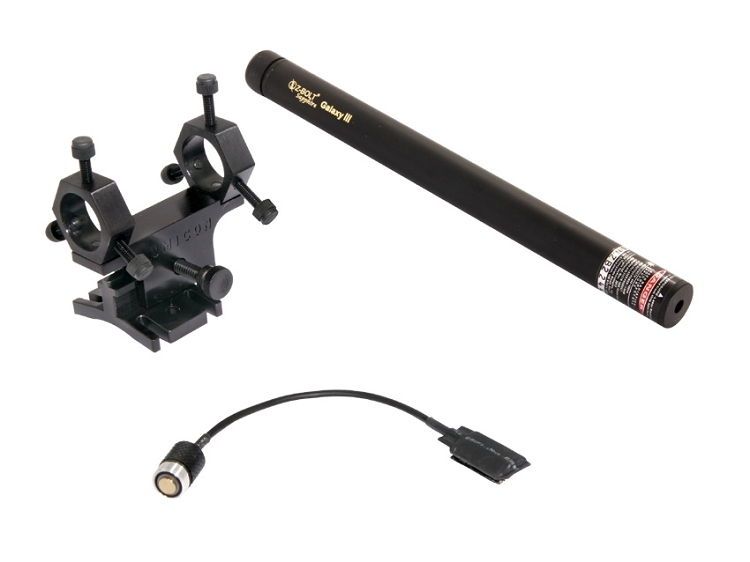 Mount your Laser Bracket to any camera tripod with standard 1/4-20 threads. Remote cable switch to activate green laser pointer without touching telescope when aligned as a star finder. Prevents unwanted movements that affect delicate finder alignments. For use with green or blue astronomy lasers in finder mounts and alignment setups. Designed for the outdoors; rugged and reliable; dirt and moisture resistant. Cable switch can be "velcro" attached to telescope body; or allowed to dangle freely.